Kalimpong: The earnings of almost 10,000 families in the hills who are chiefly engaged in the cultivation of large cardamom have come down by half this year because of the fall in the price of the spice which is particularly in demand in the overseas markets. A kilogram of large cardamom used to fetch about Rs 1,000 in the local market, but the price has come down to around Rs 500 per kilogram this year. A part of the reason for the low price, experts said, lies with the farmers themselves as they are reluctant to adopt new methods of drying the cardamom. An official of the Spices Board of India's Kalimpong zonal office said cardamoms once harvested would have to be dried, but the traditional way of drying in the hills were proving to be unhealthy. "The cardamoms are smoke-dried in a bhatti (oven). This results in a high content of carbon deposits in the cardamoms. With consumers, especially in the overseas market, becoming increasingly health-conscious, they are reluctant to buy cardamoms from the hills," said the official. The large cardamoms are mostly exported to Pakistan, Bangladesh and middle east countries. Cardamom is cultivated over 3,500 hectares in the districts of Kalimpong and Darjeeling. "A number of 9893 families in the hills are engaged in cardamom farming. The hills produce 1,043 metric tonnes of cardamom annually," said the official. Even though the Spices Board is trying to wean away local farmers from their old method, not many are willing to make the change. "We are trying to educate the farmers. We want them to shift to modified bhattis, which are smoke-free. We are willing to provide them training and offer subsidy," said the official. Bhim Bahadur Rai, a farmer from Pabong village, however, said the modified ovens were too small and they took a lot time to dry cardamoms. "If the modified ovens are the same ones that are used to dry small cardamoms in Kerala, they don't work here. Some of us have tried using them, but because of the slow process of drying, a lot of produce rot. The alternative, according to my personal experience, is to use hard and dry woods in the oven because they emit less smoke," he said. Rai cultivates cardamom in over one acre of land in his native village, which is about 30km from here. Most of the farmers The Telegraph spoke to were clueless to the reasons for the fall in price. "Yes, the prices have fallen by almost half this year, but I don't know the reason. I have sold all my produce in the village to traders," said Sahadev Subba, a farmer who is also from Pabong village. The Spices Board official said the other reasons for the poor price was the use of pesticide after harvesting to keep away pests and competition from new cardamom producing centres like Nagaland, Arunachal Pradesh and also China. "The local farmers are also not interested in selling their produce through e-auction, which could fetch them better price. They prefer to sell their produce to middlemen in their own villages," the official said. 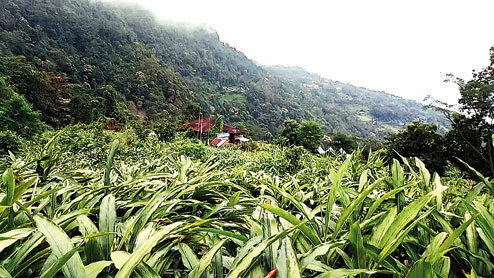 The earnings of almost 10,000 families in the hills who are chiefly engaged in the cultivation of large cardamom have come down by half this year because of the fall in the price of the spice which is particularly in demand in the overseas markets.